After starting in Scotland, the Bond seven-day Blu-ray tour took in Manchester, Wales, and Peterborough, and reached Stoke Park, Buckinghamshire, on Friday September 21. On Wednesday September 19, the ‘Quantum of Solace’ Aston Martin arrived at Penbryn Beach, in Wales, which doubled for North Korea in the very last scene of ‘Die Another Day’ (2002). The scene in the movie involved a sweeping shot along the beach by a helicopter, taking in a cliff-top hut. This was the hut where (in the plot) Bond and Jinx snuggled up together in what proved to be Pierce Brosnan’s final scenes as 007. At Penbryn Beach, the tour was joined by Oscar-winning 007 costume designer Lindy Hemming, who presented a special gold commemorative disk to Margaret Williams, of the Welsh National Trust, which has helped publicise the location as a Bond location over the past few years. From Wales, the Blu-ray Bond tour went over to the other side of the UK and reached the Nene Valley Railway, near Peterborough, on Thursday September 20 (see our previous news report). Here the tour was joined by director John Glen, stunt co-ordinator Paul Weston, and a crew from the BBC’s ‘One Show’. The ‘One Show’ report was transmitted on BBC-1 on Friday, September 21. And on Friday, September 21, the Blu-ray tour reached Stoke Poges Golf Club, in Buckinghamshire. This is, of course, the location for the now famous golf match scenes between 007 and Auric Goldfinger in ‘Goldfinger’ (1964). Bond girls Tania Mallet (from ‘Goldfinger’), Eunice Gayson, and Britt Ekland joined the special day, and Tania, Eunice, and Britt gave various interviews to the media, including to Sky News, which broadcast their report on the Friday evening. There was also extensive coverage of the Stoke Poges events in the British newspapers on Saturday September 22. The UK’s ‘Daily Express’, for example, featured Britt Ekland on its front page and there was a special report inside. Britt told the newspaper: ‘We’re never Bond women, we’ll always be Bond girls. It’s always so much fun catching up with my fellow Bond girls but today was particularly special because it’s the golden anniversary’. 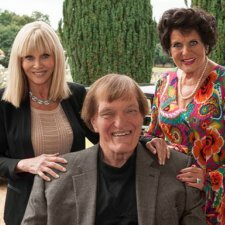 Another special guest at the Stoke Poges events on Friday was Richard Kiel, who played ‘Jaws’ in two James Bond movies. The next day (Saturday, September 22), there was a special ‘Goldfinger’ day in central London, as part of a large film memorabilia fair held at the Westminster Central Hall, organised by the London Film Memorabilia Convention. Guests included Honor Blackman, Shirley Eaton, Tania Mallet, Margaret Nolan, and Burt Kwouk, as well as other members of the crew from the third James Bond film. Sir Ken Adam, the designer of some of the most iconic sets of the Bond series, including the famous Fort Knox set, was also a special guest and was interviewed on stage. All in all, it was a fantastic day for ‘Goldfinger’ fans. Eunice Gayson, who has had a key part in the Bond Blu-ray tour, has promised she will attend the next London Film Memorabilia Convention, to be held in November.